With the State Library’s major Victor Hugo exhibition coming up in July, the name of Charles Marville has been getting mentioned in despatches recently. 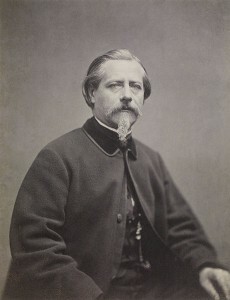 One of the very greatest photographers of the 19th century, Marville (real name Charles Francois Bossu) initially tried his hand as an illustrator during the great flowering of illustrated journals and newspapers of the day, but soon turned his hand to the new process of photography. 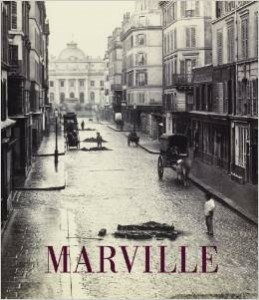 Employed to document the changing face of Paris during the remarkable transformation of the city under Baron Haussmann, Marville’s extraordinary photographs capture not just a city in transition, but a city frozen in time between two radically different eras. Utterly remarkable! This beautiful book was released last year to coincide with the exhibition of Charles Marville’s photographs at the National Gallery of Art in Washington. A collaboration between French and American scholars, the book presents new research into Marvilles life and career, and contains beautiful reproductions of his photographs. By a serendipitous act of history the State Library of Victoria holds a large collection of Charles Marville’s photographs. 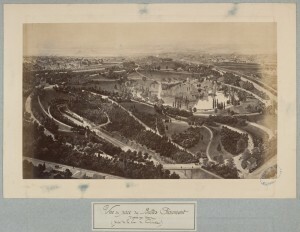 These were sent to Australia by the French Government in 1879 for the Sydney International Exhibition, and then exhibited the following year at the Melbourne International Exhibition of 1880. Rather than pay the cost of freighting the material back home the French Government made a gift of many items from the exhibition to what was then the Melbourne Public Library. 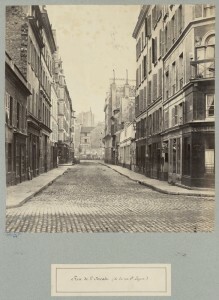 The photographs are bound in two heavy volumes, one titled Edicules etablis sur la voise publique (small public edifices) and the other Eclairage au gas (gas lighting). There is also a collection of unbound pages where the photographs are mounted on both sides of distinctive blue card. As this new book explains these were originally exhibited in glass frames hinged around a central pole. People viewed the photographs by turning the glass frames to view the images on either side. This extraordinary collection has been digitised by the library and can be seen here. 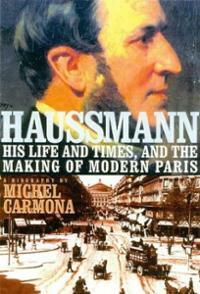 The 19th century transformation of Paris is a remarkable story in itself.